Here's a list of some of the most pesticide contaminated fruits & veggies at your average supermarket. If you can, try and buy the organic versions of these produce. This is one of my favorite all purpose seasonings for every day cooking: Trader Joe's 21 Salute. It's like a cross trainer shoe of spices. Have you heard of the Yacon, a fruit from the Andes in Peru which is loaded with fiber and is pretty low on the sugar. Dried Yacon is a great snack for the sugar conscious and diabetic. Need a quick non-meat protein dish that requires no cooking? Try this Butter Beans with cherry tomatoes, red onion, and red wine vinegar. 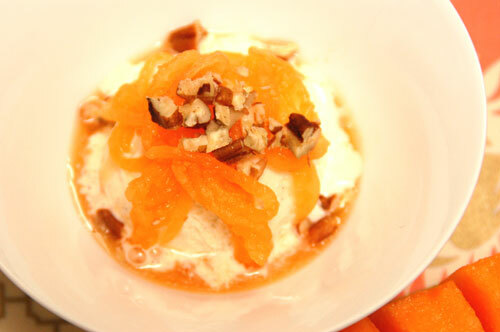 This is one of my absolute favorite summer desserts: Tuscan cantaloupe with agave nectar on top of organic vanilla bean ice cream. Oh so yummy!